The record is made up of 1 file (53 folios). It was created in 1 Jan 1945-31 Dec 1945. It was written in English. The original is part of the British Library: India Office The department of the British Government to which the Government of India reported between 1858 and 1947. The successor to the Court of Directors. Records and Private Papers. 137. LABOUR TROUBLES - BAPCO . through representatives of the strikers. 138. LABOUR TROUBLES - DHAHRAN . of meetings of representatives is not known as yet. 139. ' PERILS OF THE DEEP . NS. for political Agent A mid-ranking political representative (equivalent to a Consul) from the diplomatic corps of the Government of India or one of its subordinate provincial governments, in charge of a Political Agency. , Bahrain. 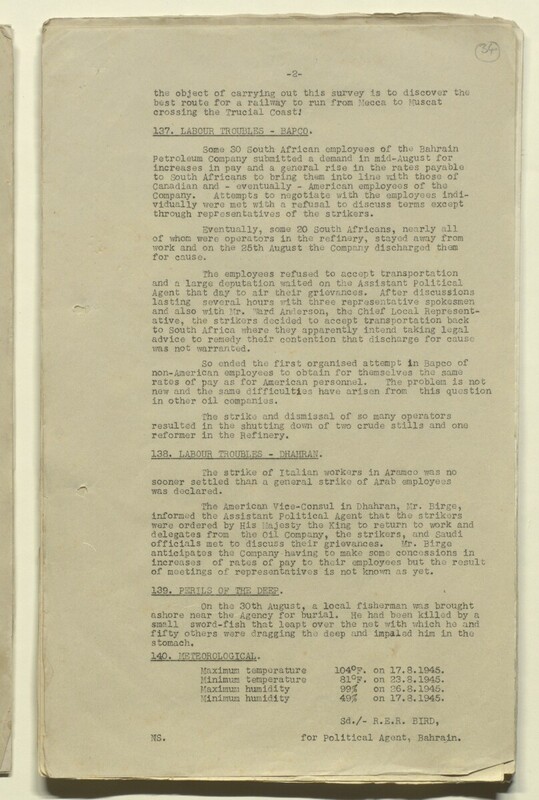 The file contains fortnightly intelligence summaries produced by the Political Agency An office of the British Government and, earlier, of the East India Company. at Bahrain for the year 1945. The reports, marked as secret, were sent to the Government of India, the India Office The department of the British Government to which the Government of India reported between 1858 and 1947. The successor to the Court of Directors. , and numerous diplomatic, political, and military offices in the Middle East. Each report is numbered from 1 to 24 and covers a two week period. Foliation: the main foliation sequence (used for referencing) commences at the front cover with 1, and terminates at the inside back cover with 54; these numbers are written in pencil, are circled, and are located in the top right corner of the recto The front of a sheet of paper or leaf, often abbreviated to 'r'. side of each folio. An additional foliation sequence is present in parallel between ff 2-13; these numbers are also written in pencil, but are not circled, and are located in the same position as the main sequence.